This article is about the Hindu gods. For the film, see Trimurti (film). 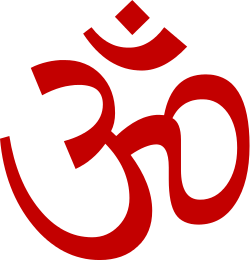 The "Trimūrti" (/trɪˈmʊərti/; Sanskrit: त्रिमूर्तिः trimūrti, "three forms") is the trinity of supreme divinity in Hinduism in which the cosmic functions of creation, maintenance, and destruction are personified as a triad of deities, typically Brahma the creator, Vishnu the preserver, and Shiva the destroyer/transformer, though individual denominations may vary from that particular line-up. When all three deities of the Trimurti incarnate into a single avatar, the avatar is known as Dattatreya. The Puranic period saw the rise of post-Vedic religion and the evolution of what R. C. Majumdar calls "synthetic Hinduism." Its most notable expression is to be found in the theological conception of the Trimūrti, i.e., the manifestation of the supreme God in three forms of Brahmā, Viṣṇu, and Śiva... But the attempt cannot be regarded as a great success, for Brahmā never gained an ascendancy comparable to that of Śiva or Viṣṇu, and the different sects often conceived the Trimūrti as really the three manifestations of their own sectarian god, whom they regarded as Brahman or Absolute. Early western students of Hinduism were impressed by the parallel between the Hindu trinity and that of Christianity. In fact the parallel is not very close, and the Hindu trinity, unlike the Holy Trinity of Christianity, never really "caught on". All Hindu trinitarianism tended to favor one god of the three; thus, from the context it is clear that Kālidāsa's hymn to the Trimūrti is really addressed to Brahmā, here looked on as the high god. The Trimūrti was in fact an artificial growth, and had little real influence. 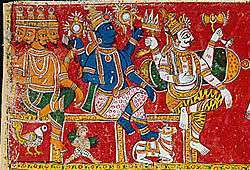 There must be some doubt as to whether the Hindu tradition has ever recognized Brahma as the Supreme Deity in the way that Visnu and Siva have been conceived of and worshiped. Freda Matchett characterizes the Trimurti system as one of "several frameworks into which various divine figures can be fitted at different levels." The concept of Trimurti is also present in the Maitri Upanishad, where the three gods are explained as three of his supreme forms. Temples dedicated to various permutations of the Trimurti can be seen as early as the 8th century C.E., and there are even temples today in which the Trimurti are actively worshiped. The Saura sect that worships Surya as the supreme person of the godhead and saguna brahman doesn't accept the Trimurti as they believe Surya is God. Earlier forms of the Trimurti sometimes included Surya instead of Brahma, or as a fourth above the Trimurti, of whom the other three are manifestations; Surya is Brahma in the morning, Vishnu in the afternoon and Shiva in the evening. Surya was also a member of the original Vedic Trimurti, which included Agni and Vayu. Some Sauras worship either Vishnu or Shiva as manifestations of Surya, others worship the Trimurti as a manifestation of Surya, and others exclusively worship Surya alone. Shaivites hold that, according to Shaiva Agama, Shiva performs five actions - creation, preservation, dissolution, concealing grace, and revealing grace. Respectively, these first three actions are associated with Shiva as Sadyojata (akin to Brahma), Vamadeva (akin to Vishnu) and Aghora (akin to Rudra). Thus, Brahma, Vishnu and Rudra are not deities different from Shiva, but rather are forms of Shiva. As Brahma/Sadyojata, Shiva creates. As Vishnu/Vamadeva, Shiva preserves. As Rudra/Aghora, he dissolves. This stands in contrast to the idea that Shiva is the "God of destruction." To Shaivites, Shiva is God and performs all actions, of which destruction is only but one. Ergo, the Trimurti is a form of Shiva Himself for Shaivas. Shaivites believe that Lord Shiva is the Supreme, who assumes various critical roles and assumes appropriate names and forms, and also stands transcending all these. 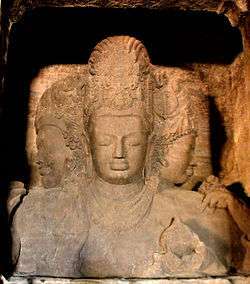 A prominent visual example of a Shaivite version of the Trimurti is the Trimurti Sadashiva sculpture in the Elephanta Caves on Gharapuri Island. The feminist Shaktidharma denomination assigns the eminent roles of the three forms (Trimurti) of Supreme Divinity not to masculine gods but instead to feminine goddesses: Mahasarasvati (Creator), Mahalaxmi (Preserver), and Mahakali (Destroyer). This feminine version of the Trimurti is called Tridevi ("three goddesses"). The masculine gods (Brahma, Vishnu, Shiva) are then relegated as auxiliary agents of the supreme feminine Tridevi. Smartism is a denomination of Hinduism that places emphasis on a group of five deities rather than just a single deity. The "worship of the five forms" (pañcāyatana pūjā) system, which was popularized by the ninth-century philosopher Śankarācārya among orthodox Brahmins of the Smārta tradition, invokes the five deities Ganesha, Vishnu, Shiva, Devi and Surya. Śankarācārya later added Kartikeya to these five, making six total. This reformed system was promoted by Śankarācārya primarily to unite the principal deities of the six major sects on an equal status. The monistic philosophy preached by Śankarācārya made it possible to choose one of these as a preferred principal deity and at the same time worship the other four deities as different forms of the same all-pervading Brahman. Vishnu with Lakshmi, on the serpent Ananta Shesha, as Brahma emerges from a lotus risen from Vishnu's navel. Despite the fact that the Vishnu Purana describes that Vishnu manifests as Brahma in order to create and as Rudra (Shiva) in order to destroy, Vaishnavism generally does not acknowledge the Trimurti concept. For example, the Dvaita school holds Vishnu alone to be the supreme God, with Shiva subordinate, and interprets the Puranas differently. For example, Vijayindra Tîrtha, a Dvaita scholar interprets the 18 puranas differently. He interprets the Vaishnavite puranas as satvic and Shaivite puranas as tamasic and that only satvic puranas are considered to be authoritative. Unlike most other Vaishnavite schools such as those of Ramanuja, Madhva and Chaitanya, Swaminarayan, guru of the Hindu Swaminarayan sects (including BAPS), did not differentiate between Vishnu and Shiva; Swaminarayan notably differs from practically all Vaishnavite schools in holding that Vishnu and Shiva are different aspects of the same God. (see also verses 47 and 84 of Shikshapatri, a key scripture to all followers of the Swaminarayan faith.) Moreover, Swaminarayan followed a Smarta approach (see more detail on the Smarta view below) by instructing his followers to venerate all five deities of the Panchayatana puja with equal reverence. ↑ "Trimurti". Random House Webster's Unabridged Dictionary. ↑ Grimes, John A. (1995). Ganapati: Song of the Self. SUNY Series in Religious Studies. Albany: State University of New York Press. ISBN 0-7914-2440-5. ↑ Jansen, Eva Rudy (2003). The Book of Hindu Imagery. Havelte, Holland: Binkey Kok Publications BV. ISBN 90-74597-07-6. ↑ Winternitz, Maurice (1972). History of Indian Literature. New Delhi: Oriental Books Reprint Corporation. ↑ For the Trimurti system having Brahma as the creator, Vishnu as the maintainer or preserver, and Shiva as the transformer or destroyer. see Zimmer (1972) p. 124. ↑ Mhatre, Sandeep. "Datta Sampradaay and Their Vital Role". Swami Samarth temple. ↑ For dating of Puranic period as c. CE 300-1200 and quotation, see: Majumdar, R. C. "Evolution of Religio-Philosophic Culture in India", in: Radhakrishnan (CHI, 1956), volume 4, p. 47. ↑ For characterization as non-homogeneous and including multiple traditions, see: Majumdar, R. C. "Evolution of Religio-Philosophic Culture in India", in: Radhakrishnan (CHI, 1956), volume 4, p. 49. ↑ For harmony between orthodox and sectarian groups, see: Majumdar, R. C. "Evolution of Religio-Philosophic Culture in India", in: Radhakrishnan (CHI, 1956), volume 4, p. 49. ↑ For quotation see: see: Majumdar, R. C. "Evolution of Religio-Philosophic Culture in India", in: Radhakrishnan (CHI, 1956), volume 4, p. 49. ↑ Winternitz, volume 1, p. 452, note 1. ↑ For references to Kūrma Purana see: Winternitz, volume 1, p. 573, note 2. ↑ Sutton, Nicholas (2000). Religious doctrines in the Mahābhārata (1st ed.). Delhi: Motilal Banarsidass Publishers. p. 182. ISBN 81-208-1700-1. ↑ Matchett, Freda. "The Purāṇas", in Flood (2003), p. 139. ↑ How can the god of destruction be the Supreme ? ↑ Dating for the pañcāyatana pūjā and its connection with Smārta Brahmins is from Courtright, p. 163. ↑ For worship of the five forms as central to Smarta practice see: Flood (1996), p. 113. ↑ Sharma, B. N. Krishnamurti (2000). A history of the Dvaita school of Vedānta and its literature: from the earliest beginnings to our own times. Motilal Banarsidass Publishers. p. 412. ISBN 81-208-1575-0. Retrieved 2010-01-15. ↑ According to this site, http://www.kakaji.org/shikshapatri_verses.asp?catid=viewAll, verses 47, 84, of their scripture, Shikshapatri, a key scripture to all followers of the Swaminarayan faith. 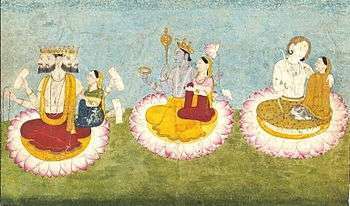 states, "And the oneness of Narayana and Shiva should be understood, as the Vedas have described both to be brahmaroopa, or form of Brahman, i.e., Saguna Brahman, indicating that Vishnu and Shiva are different forms of the one and same God."